This was a pretty hard choice to make as we have so many wonderfully indulgent chocolate recipes. In the end, we went for this one – our brown sugar and raw cacao pavlova which almost sounds healthy! Although it has a deep chocolatey flavor from the cacao it is also light and the brown sugar makes it delightfully chewy, almost toffee like. We have chosen to use coconut yoghurt for the wonderful flavor, but feel free to simply whip up some cream. It is all about the crunch – having roasted mixed nuts but also we love making a brittle. Its very easy you just melt sugar in a pan till all has turned to caramel, mix in nuts and very quickly pour out onto greaseproof paper and let to set, then break up and scatter over the pavlova. 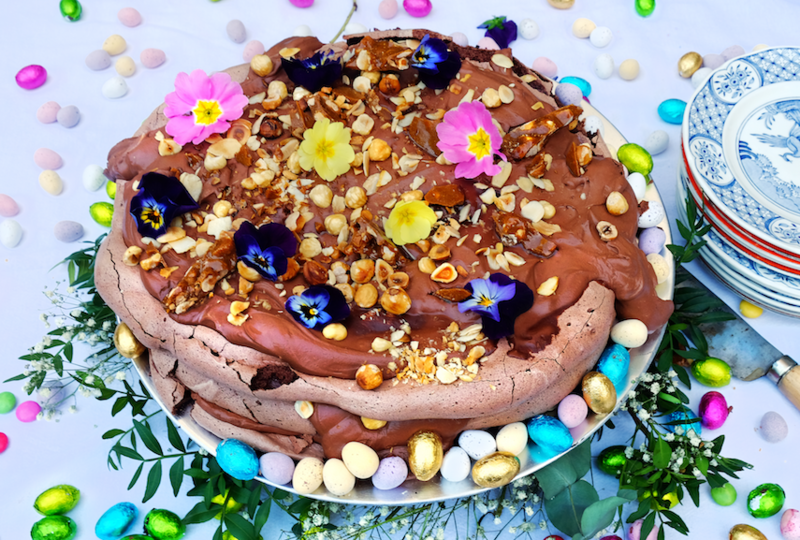 The best thing about this recipe is that its really easy but it looks like a masterpiece – certainly has the wow factor if you have any kids around this Easter their eyes will be out on stalks!! Half of this recipe is in the making of the pavlova, but the other half is in the decoration, we would say go all out!! And its the best part – use berries, edible flowers and as many Easter eggs as you can get your little paws on. Cacao is the purest form of chocolate that you can consume, which means it is raw and much less processed than cocoa powder or chocolate bars. It does not have all the excess sugars and fats of processed chocolate and actually is very high in antioxidants and magnesium. It was has been used for generations in different cultures for health purposes. It is pretty easy to get hold of these days, most health food shops and large supermarkets will stock it. This is a good recipe to keep in mind, it doesn’t have to be used just for Easter, if you strip away the eggs and add a mound of strawberries and mint you have a wonderful summer pudding, and hey presto you have a pretty magnificent birthday cake. We did it recently on a job, portraits being shot for Vogue – and we made a huge one, I was seriously looking forward to trying a sneaky piece, but when I went out after lunch it was all been finished, every last crumb!